Attic and crawl spaces often remain the neglected and ignored areas of the property. These areas get our attention only when the problems go out of hand. Pests, termites, fungus and mold is only a partial list of invaders that may exist in those spices. Periodic assessment and monitoring of the attic spaces is important to make them safe, comfortable and effective. Timely action doesn’t only cuts down on risk of evacuation, but also prevents huge financial expenses. We, at Quartz Solutions, are the leader in the field. 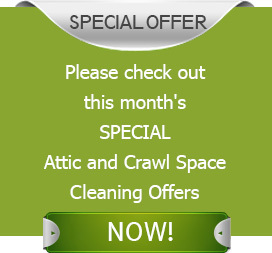 Our personalized services will help you solve all your attic related problems in the most professional manner. Unattended attic and crawl spaces are breeding ground for a range of problems. Leaking and dripping ducts impair the property’s insulation system and thereby inflate the utility bills manifold. 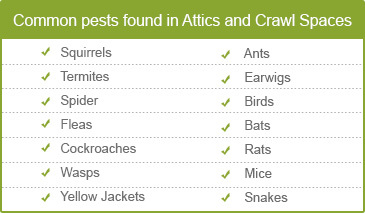 Insects such as wasps, roaches and termites spread diseases when inside the house. Animals like mice, rats and bats damage the structure of the building, electric wiring and upholstery. Excessive moisture provides the perfect conditions for mold and mildew to grow. Its presence can trigger wood rot, contaminate air and cause breathing troubles. A complete inspection of the attic and crawl space is essential for a long term maintenance of the property. We, at Quartz Solutions, are equipped and experienced to carry out the preliminary assessment of the property free without chargng you at all. Once problems are found, our experts will put forth the most comprehensive and viable option to get the property back in shape. We, at Quartz Solutions, strive to provide the most viable services at the most competitive prices with no hidden cost. The beautiful borough of Hillsdale in Bergen County, NJ, is home to nearly 10,000 residents. Nicely built homes and offices span throughout the area. Through our supreme attic and crawl space services, we promise to enhance the beauty of the region and create a healthier space for you and your family.